PharmBlocker: An environmental chemical which acts on the identical cellular process as a pharmaceutical, but in a manner that decreases the effectiveness of the drug therapy. In plain words: If a substance is causal enough to investigate as a pharmaceutical, then it is causal enough to investigate as an environmental health risk. A new method is needed because current risk assessment paradigms for environmental chemicals are inadequate and often contradictory. The prevailing paradigm is dominated by traditional toxicology which relies on macro-level measurements (optical microscope, morphological measurements, mortality rates) which cannot account for profound changes that can occur at the nanomolar levels ruled by hormones, cytokines, and many environmental chemicals. Animal studies do not necessarily translate into human effects. Low-level tests using acceptable,traditional animal tests are often inconsistent. Human trials, of course could settle many of the issues inherent in animal and lab investigations. Indeed, academic and university researchers use the same types of laboratory experiments that pharmaceutical researchers do to discover new drugs. Those lab investigations, if promising, must then go on to human trials to prove they are safe and effective. However, traditionalists contend that human trials are prohibitively expensive and unethical because they would involve exposing test subjects to potential toxic compounds. The issue of traditional methods versus more current scientific investigations such as those required for the evaluation and approval of new pharmaceuticals, presents a serious public health issue. This prevails across the entire sector of chemical risk assessment, and can be clearly illustrated by the controversy over the safety of BPA. Chemical trade organizations and manufacturers rely exclusively upon traditional risk assessments and declare that BPA is unequivocally safe (Facts about BPA). Those safety claims are made despite hundreds of current, published, peer-reviewed, university, and medical studies to the contrary. Many of those current studies are cited among the 845 citations in this article: Hormones and Endocrine-Disrupting Chemicals: Low-Dose Effects and Nonmonotonic Dose Responses7. In addition, safety claims based on traditional toxicological methods continue to be made despite the fact that some highly promoted studies are so flawed in design, science, and execution that they should be retracted: Low-Dose BPA Paper In Toxicological Sciences Fatally Flawed & Should Be Retracted. Pharmaceutical trials: A more accurate risk-assessment method. As pharmaceutical companies have shown, human trials of a single compound can cost millions of dollars. This is significant because of the estimated 84,000 legal chemicals in common use today in America, fewer than 200 have been tested8. U.S. Federal regulatory approvals of chemicals, therefore, are allowed to enter the environment based on unpublished-non-peer-reviewed risk assessment studies done by chemical manufacturers or private labs they hire. (See: “Good Laboratory Practices”). Pharmaceutical companies often begin prospecting for new drugs by looking at promising lab data that identify cellular signaling pathways as well as genetic (or epigenetic) over- or under-expression of specific molecules. The pharmaceutical discovery process recognizes that malfunctions in still-functioning cells can create conditions on the molecular level that promote a host of diseases. However, the thousands of molecular pathways in a cell have a mind-boggling complexity that resemble an incoherent maze and seem to work like a combination of a pinball machine and Rube Goldberg’s wildest concoction. 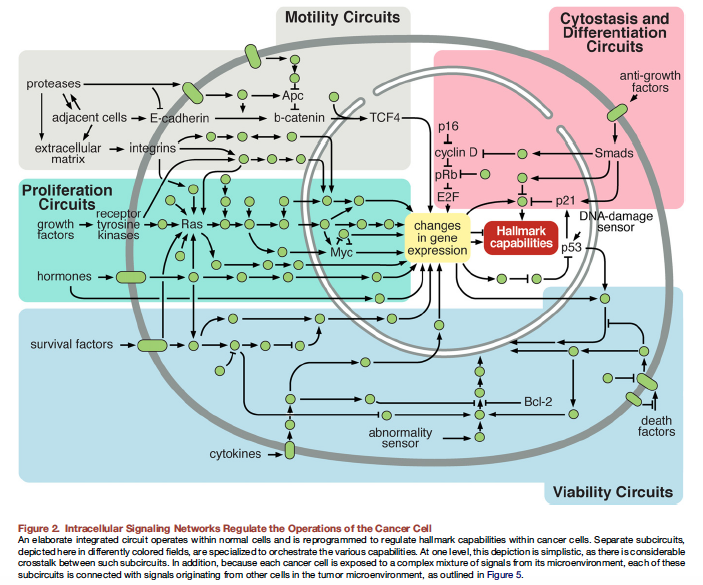 For one example, see the diagram, below, from Hallmarks of Cancer, the landmark study published in the scientific journal Cell. Source: Hallmarks of CancerRight-click graphic to view a larger image. No one yet knows how many pathways there are. Few, if any, pathways are completely understood. Despite this, many successful pharmaceuticals have been developed by understanding how a given pathway malfunction promotes disease, then developing a drug that acts on that pathway. The author of this piece has determined that environmental chemicals can adversely affect the same mechanisms as therapeutic compounds. For a recent example, see: Heat Shock Protein Hsp27 points to causal link between BPA and cancer & chemotherapy resistance. Using causal cellular and molecular mechanisms that underpin approved pharmaceuticals means that direct human trials on environmental chemical risks are available and have already done — by proxy — by drug investigators. Simply stated: if a safe and effective drug is shown to act therapeutically on a cellular or molecular process in a specific, proven manner, then an environmental chemical that acts as an antagonist to that pharmaceutical in the same precise manner should be suspected as a contributing cause of the disease or syndrome the drug has been proven to cure. The therapeutic effectiveness of pharmaceuticals has established causal relationships to the modern-day onslaughts of cancers, Type 2 diabetes, obesity, Alzheimer’s Disease, behavioral disorders and other diseases and syndromes. Not one penny of public or private money is needed to get the PharmBlocker paradigm rolling. It just requires modest cross-disciplinary curiosity. In someways, it’s like a cross-word puzzle that requires the player to have a “vocabulary”of molecular pathways and the harms done when they go awry. As one example, this small online paper — Hypomethylation Of Cdk5 Protein Offers Possible Causal Link Between BPA and Medullary Thyroid Cancer –began when the author of this article read a news release about Alzheimer’s researchers accidentally discovering that the over-expression of the CDK5 protein resulted in a massive increase in malignant Medullary Thyroid Cancer. Based on an intensive reading of papers on environmental chemicals that numerous studies had implicated Bisphenol A in causing cancers of various types, the author used Google Scholar and Science Direct to search for variations on “+CDK5 + Bisphenol.” Those searches produced the information that resulted in the small article linked above. What’s Needed To Use The PharmBlocker Method? Knowledge of confirmed molecular pathway malfunctions identified in studies of environmental chemicals. Cross-referencing environmental pathway malfunctions with those identified in studies of cancer, obesity, cardiovascular disease, Type 2 Diabetes, Alzheimer’s Disease etc. Particular attention should be paid to pharmaceuticals already approved for human use or in Stage II or higher trials. Cross-referencing environmental pathway malfunctions with peer-reviewed studies whose abstracts or conclusions state that the same identified pathway (offers promise as a target for pharmaceutical intervention. Careful attention to journal and news reports of new pharmaceuticals and drug trials, always looking first to identify the molecular pathway or compound involved. Use of Google Scholar and Science Direct to search for variations that compound or pathway and the environmental chemical in question.. Shots in the dark can also be fruitful. It costs on a few seconds to check your hunches about connections. An increasing number of the same molecular compounds and pathways are beginning to be implicated in cancer, obesity, cardiovascular disease, Type 2 Diabetes, Alzheimer’s Disease. It is not beyond the realm of possibility that the same pharmaceutical — or the removal of an PharmBlocker — could improve the prospects for patients. 2. Neltner TG, Kulkarni NR, Alger HM, et al. Navigating the U.S. Food Additive Regulatory Program. Compr Rev Food Sci F 2011;10:342–68. 3. Muncke, Jane, John Peterson Myers, Martin Scheringer, and Miquel Porta. “Food packaging and migration of food contact materials: will epidemiologists rise to the neotoxic challenge?.” Journal of epidemiology and community health (2014). 5. National Report on Human Exposure to Environmental Chemicals, U.S. Centers for Disease Control, Fourth report, Updated 2015 Tables, http://www.cdc.gov/exposurereport/index.html, accessed 11 July 2015. 7. Vandenberg LN, Colborn T, Hayes TB, et al. Hormones and Endocrine-Disrupting Chemicals: Low-Dose Effects and Nonmonotonic Dose Responses. Endocrine Reviews. 2012;33(3):378-455. doi:10.1210/er.2011-1050.